The town switched to a pyrotechnics display, like you might see at a rock concert, over fireworks for its holiday celebrations going forward, so as not to terrify the thousands of animals, wild and domestic, who live in the area. Many of the estimated 8,000 human residents of the City of Banff and 25,000 Canada Day visitors to Banff National Park may have awakened the next day, July 2, 2018, with headsplitting hangovers. Unaccustomed outdoor exercise, a hot late night, a high pollen count, and too much beer took their toll among the guests and residents, as always. But Grizzly Bear #126, the laid-back, almost friendly unofficial Banff National Park greeter, probably turned in early, slept well, and was up again at dawn without a headache for possibly the first post-Canada Day morning in his dozen-year life. Likewise fringing on Banff National Park, the town of Canmore, Alberta “also ditched traditional fireworks in favor of “low-noise” fireworks, which operate the same as regular ones but without as big a boom,” Hauen wrote. “Jasper,” hub of Jasper National Park, just to the north, “cancelled their Canada Day fireworks altogether because of wildfire concerns,” Hauen added. The end of noisy fireworks in Banff, Canmore, and Jasper was requested by the organization Bow Valley Naturalists. “Anybody who’s had a cat and dog in the vicinity of fireworks knows what it’s like – you’ve got a pet adapted to an urban environment and often they run away or hide under the bed. So you can imagine the impact that might have on wild animals,” Bow Valley Naturalists vice president Reg Bunyan told Hauen. Few cities in the world are more economically dependent on wildlife-related tourism than Banff, which annually welcomes more than four million visitors per year. Hiking, jogging, trail-bicycling, horseback riding, skiing, white-water rafting, rock-climbing, outdoor concerts, and practically every other popular recreational activity that can be done in a national park are among the Banff attractions, but the particular allure of Banff is the opportunity for visitors to enjoy spontaneous wildlife encounters while enjoying their more structured and pre-planned activities. Among the often seen species, besides grizzly bears, are black bears, wolves, elk, moose, mountain goats, bighorn sheep, deer, and coyotes, all with hearing far more sensitive than that of humans, none easily inured to sudden bangs. Banff deputy mayor Corrie DiManno quickly saw Bow Valley Naturalists’ point, and realized the ease of changing the Canada Day celebration to minimize noise. Grizzly Bear #126, a polite bear as grizzlies go, probably would have said thanks, had he known of the Banff decision. 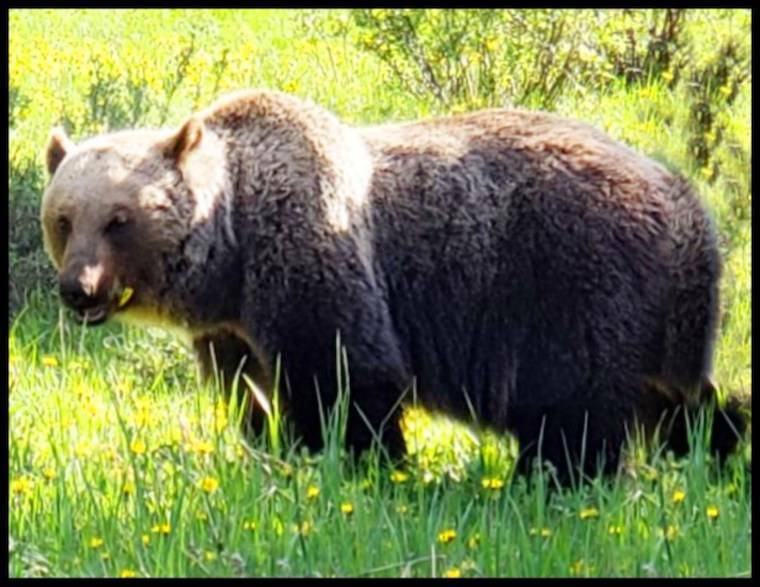 Usually patrolling the Trans-Canada Highway near Lake Louise and/or the railway embankment between Banff and Canmore, often seen eating the local giant dandelions and other wildflowers, Grizzly Bear #126 is not the most famous of the celebrated Banff grizzlies. That distinction goes to his slightly older relative, Grizzly Bear #122, also called The Boss. The Boss, father of more grizzly cubs than any other bear in the park, is known for having killed and eaten an entire black bear in August 2013, and for somehow becoming soaked with oil while feeding along the railway in May 2014, a misadventure The Boss survived without apparent enduring consequence. But Grizzly Bear #126 may be the most often seen and photographed Banff grizzly, tending to ignore humans, if not exactly posing for close-ups––and, unlike his late girlfriend, Grizzly Bear #148, Grizzly Bear #126 seems uninclined to get into trouble, despite spending most of his time closer to humans than any others.